KTM Asia Motorcycle Manufacturing, Inc. (KAMMI), a joint- venture partnership between Adventure Cycle Philippines, Inc., owned by AC Industrial Technology Holdings, Inc. (AC Industrials), a member of Ayala Group of Companies, and Austrian motorcycle giant KTM AG (Kronreif & Trunkenpolz Mattighofen AG), inaugurates its state-of-the-art manufacturing facility at the Laguna Technopark in Sta. Rosa, Laguna. 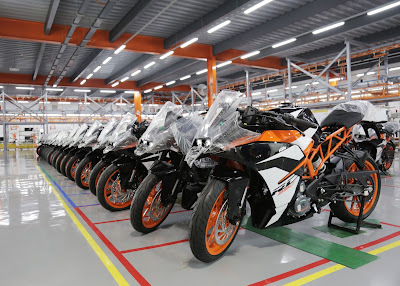 The KTM Philippines plant – which assembles four (4) KTM models such as the KTM 200 DUKE, KTM 390 DUKE, KTM RC 200 and KTM RC 390 – will have an initial production run of 6,000 motorcycles, with the goal of eventually expanding to 10,000 units annually. Apart from the domestic market, KAMMI plans to export to neighboring ASEAN markets as well as China, where some 60 million motorcycles are sold per year. Moreover, they hope to ramp up their network to 32 dealers nationwide this year, each one providing sales and after-sales support.